I was reading about the killing in Seattle which took place on Saturday, March 25, 2006 and discovered that the people who were in the house where the gunman did the killing were young adults and teenagers who had been at a "Zombie Rave" earlier that night. I was not even aware what a Zombie Rave was so I did a little searching and was I ever surprised. 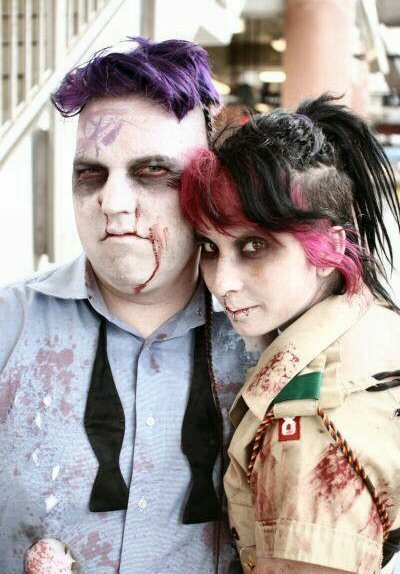 The picture below was discovered on an internet site about Zombie Raves. Can anyone believe these young people party in such a manner? Click picture for a larger version which shows more of the gruesome details of the makeup. A gunman opened fire early Saturday in a home, killing six partygoers and critically injuring at least one other before committing suicide when confronted by police. Five victims’ bodies were found. A neighbor to the house said he saw the man with the shotgun put the barrel in his mouth and fire. You might ask why I would bother writing about this kind of news and I would tell you that it is because this is just another example of how much of a stronghold Satan has on our children and young adults. We MUST do something before they are all lost. In any part of your mind have you ever imagined children dressing up as dead people and having a party. It begs the question; "Where are the parents and where was the guidance?" "What has happened in these kids lives to drive them to this type of evil activity.?" If you haven't enlarged the picture, do so now and take a real hard look at these two young people. They are lost. They may know who Jesus is but you can bet they do not have a personal relationship with Him. Pray for these kids for they need the Lord and His salvation. Pray that these deaths will not be in vain but that these kids will understand how vile their current lives and lifestyles are.